Mumbai: The Central government has raised Rs 1,150 crore by selling over 4.44 crore shares of information technology major WiproNSE 1.18 %. 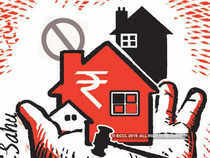 The shares were offered by the Custodian of Enemy Properties for India, an agency under the Union home ministry. Market participants now expect the agency to sell shares it holds in ACC, Tata SteelNSE 3.51 %, Tata Power, India CementsNSE 2.22 % and Grasim IndustriesNSE 1.68 %, among others. The sale of Wipro shares happened on Thursday through multiple block deals at a price of Rs 258.9 apiece. The stock gained 1.2% to close at Rs 262 apiece on Friday. All the shares being offered were bought by state-owned entities led by Life Insurance Corporation of India (LIC), which only subscribed to 3.86 crore shares or over 85% of the offering. Public sector reinsurer General Insurance Corporation of India (GIC) bought 38 lakh shares while another state insurer New India Assurance picked up 19 lakh shares, data compiled from stock exchanges showed. Enemy properties are those movable and immovable assets of Indians who migrated to either Pakistan or China. 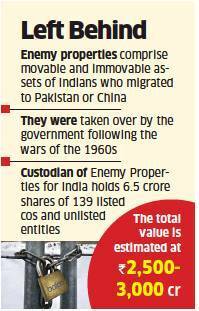 These properties were taken into the custody of Indian government in late 1960s following the wars with both the countries. Apart from large chunks of real estate spread across major Indian cities including New Delhi, Mumbai and Kolkata, there are also several other assets including shares of companies, jewellery lying with the agency. Around 6.5 crore shares of 139 listed functional companies and other unlisted entities are held by the agency, whose total value is estimated at Rs 2,500-3,000 crore. In 2017, the government approved the process to divest the equity shares held by the agency and the proceeds of these sales were to be used for state-owned development and social welfare programmes.